2 Since the late 1960s, China and the United States, which have been in a hostile relationship for a long time, have begun to make tentative and secret contacts to improve and ease relations. Since the late 1960s, China and the United States, which have been in a hostile relationship for a long time, have begun to make tentative and secret contacts to improve and ease relations. Ping pong diplomacy refers to the event in which China invited the American table tennis team to visit China in 1971. 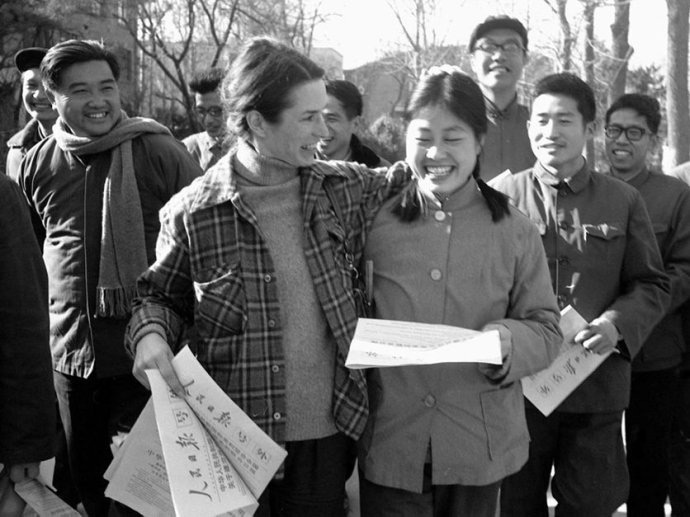 On April 10, 1971, the U.S. table tennis delegation and a small group of U.S. journalists arrived in Beijing and became the first Americans allowed to enter China since 1949. This move has had an impact on the breakthrough in Sino-U.S. relations. The friendly exchanges between the Chinese and American table tennis teams have promoted the normalization of Sino-U.S. relations. With the approval of Chairman Mao Zedong, on April 6, 1971, the Chinese table tennis team participating in the 31st World Table Tennis Championships in Nagoya, Japan, sent an invitation to the American table tennis team to visit China. A few hours after Premier Zhou Enlai made a speech, U.S. President Richard Nixon announced the retirement of a series of bans on China. In return, the US table tennis team invited the Chinese table tennis team to visit the United States. This invitation was immediately accepted. Ping-pong diplomacy was successful and resulted in opening the U.S.-PRC relationship, leading the U.S. to lift the embargo against China on June 10, 1971 and paved the road for the consequent visit of US President Richard Nixon. The visit was an important diplomatic mission that marked the culmination of the Nixon administration’s resumption of harmonious relations between the United States and China. At 11:30 on February 21, 1972, the special plane of US President Richard Nixon arrived in Beijing. Zhou Enlai and other Chinese leaders welcomed to the airport. Nixon walked down the ramp and took the initiative to shake hands with Zhou Enlai. The seven-day official visit to Beijing, Hangzhou, and Shanghai was the first time a U.S. president had visited the PRC; Nixon’s arrival in Beijing ended 25 years of no communication, nor diplomatic ties, between the two countries and was the key step in normalizing relations between the U.S. and China. Nixon visited China to gain more leverage over relations with the Soviet Union. 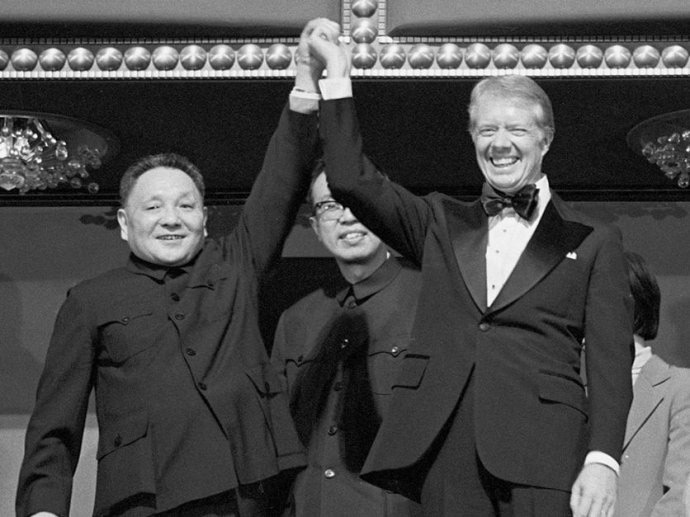 On February 21, 1972, Chairman Mao Zedong met with US President Nixon in Zhongnanhai. At 2:40 pm on February 21, 1972, Mao Zedong met Nixon in his study. That evening, Zhou Enlai held a welcome banquet for Nixon and his wife at the Great Hall of the People. After a week of consultations, on February 28th, China and the United States jointly issued the “Joint Communique” in Shanghai. The “Joint Communique” said: “The United States recognizes that all Chinese on both sides of the Taiwan Strait believe that there is only one China and that Taiwan is part of China. The U.S. government does not object to this position. On April 11, 1972, the Chinese table tennis team paid a return visit to the United States and first arrived in Detroit. The exchange of visits by the Chinese and American table tennis teams caused a stir in international public opinion and became a major event that attracted worldwide attention. “Ping-pong diplomacy” ended the isolation of personnel exchanges between China and the United States for more than 20 years, resulting in a historical breakthrough in the Sino-U.S. reconciliation. In April 1972, during the visit of the Chinese table tennis delegation to the United States, Chinese and American table tennis athletes exchanged experiences in Memphis to discuss the game. 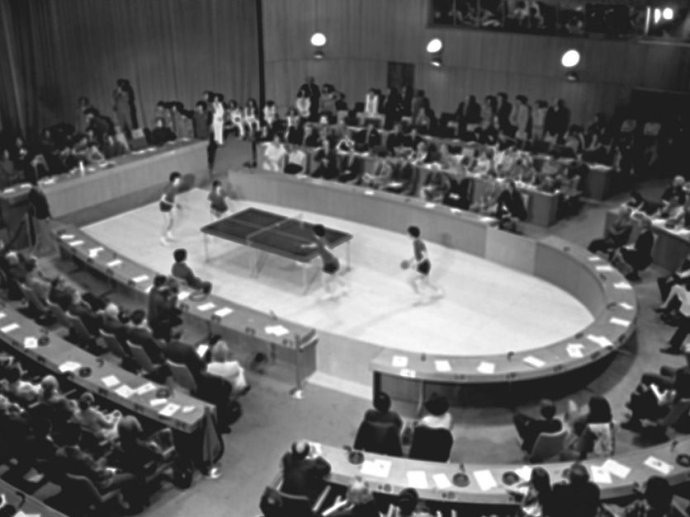 On April 19, 1972, Chinese table tennis athletes visited the United Nations headquarters in New York City and performed an exhibition match. They were warmly welcomed. In April 1972, the Chinese table tennis delegation paid a return visit to the United States. 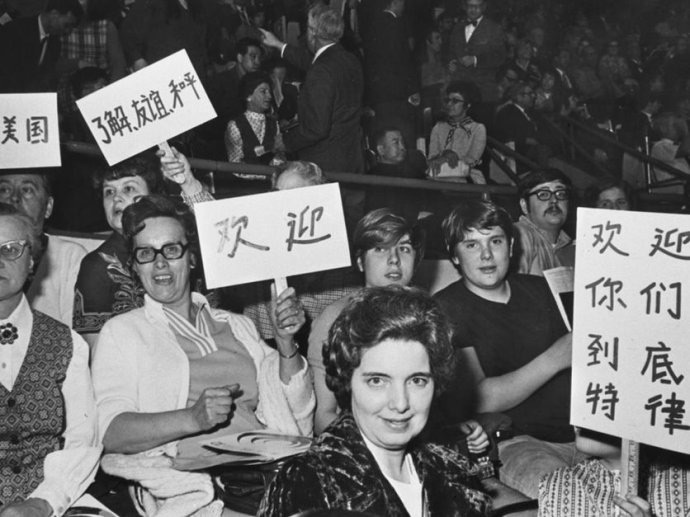 Table tennis players from China and the United States hold a placard in Chinese Detroit when they hold a match in Detroit. They welcome Chinese table tennis delegations to visit the United States. On December 16, 1978, China and the United States issued a joint communique on the establishment of diplomatic relations. Announced that China and the United States decided to recognize each other and establish diplomatic relations on January 1, 1979. Mary van der Walter, a US expert working at the Graduate School of the Chinese Academy of Sciences, talked with teachers and students about the significance of establishing diplomatic relations between China and the United States. 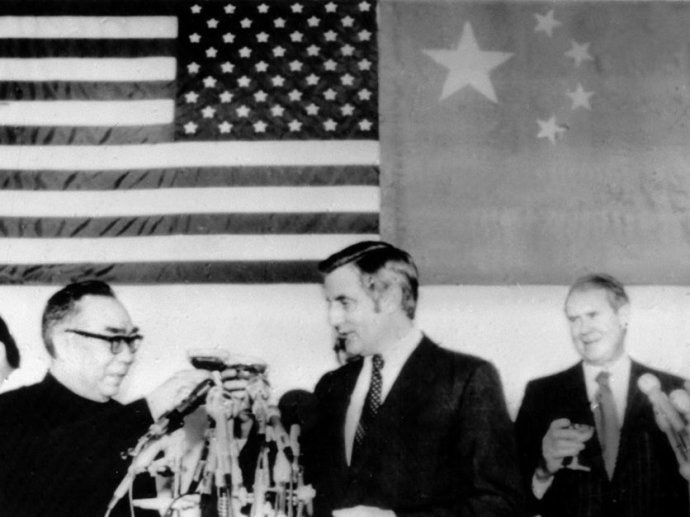 On the evening of January 1, 1979, at the reception held in Washington, the capital of the United States, Chai Zemin, director of the Chinese Liaison Office in the United States, and U.S. Vice President Mondale held a toast to celebrate the formal establishment of diplomatic relations between China and the United States. 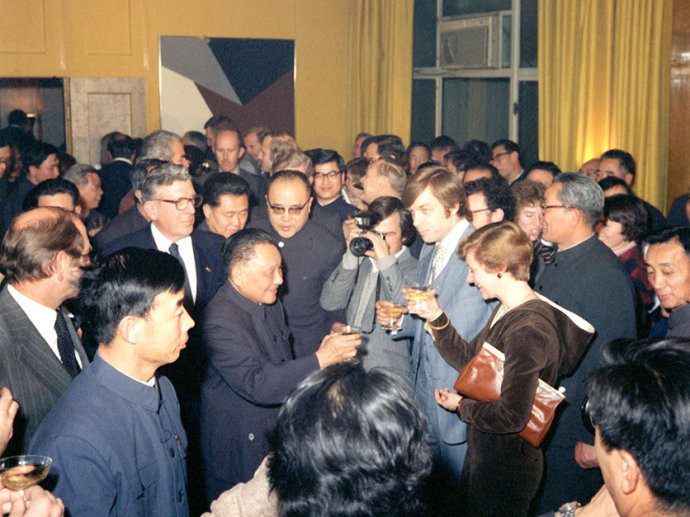 On January 1, 1979, Vice Premier Deng Xiaoping proposed a toast at the reception hosted by the US Liaison Office in China to celebrate the formal establishment of diplomatic relations between China and the United States. January 29, 1979. Deng Xiaoping watched a performance at the Kennedy Center in Washington, DC. Then, he greeted the audience with President Carter. 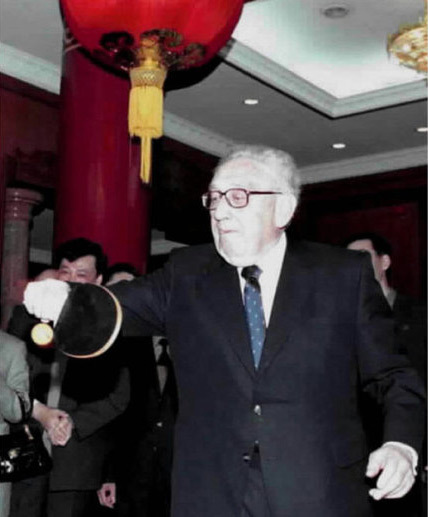 On March 18, 2001, Dr. Kissinger, former US Secretary of State, at the Commemoration of the 30th Anniversary of China-US “Ping-Pong Diplomacy”. At 17:06 on February 10th, 2013, Zhuang Zedong (August 25, 1940 – February 10, 2013), a Chinese ping pong diplomat and hero of the Chinese table tennis team, died of illness in Beijing. He died at the age of 73. 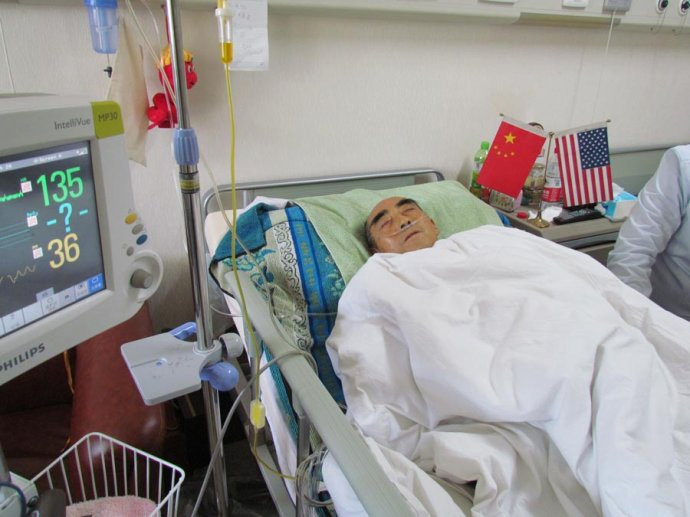 The picture shows the head of Zhuang Zedong’s sickbed on February 8 with the national flag of the United States and China, which is a symbol of friendship. This is a striking example of the U.S.-China Ping Pong diplomacy hero’s wish. This group of pictures actually recorded some of the little-known scenes at the time.